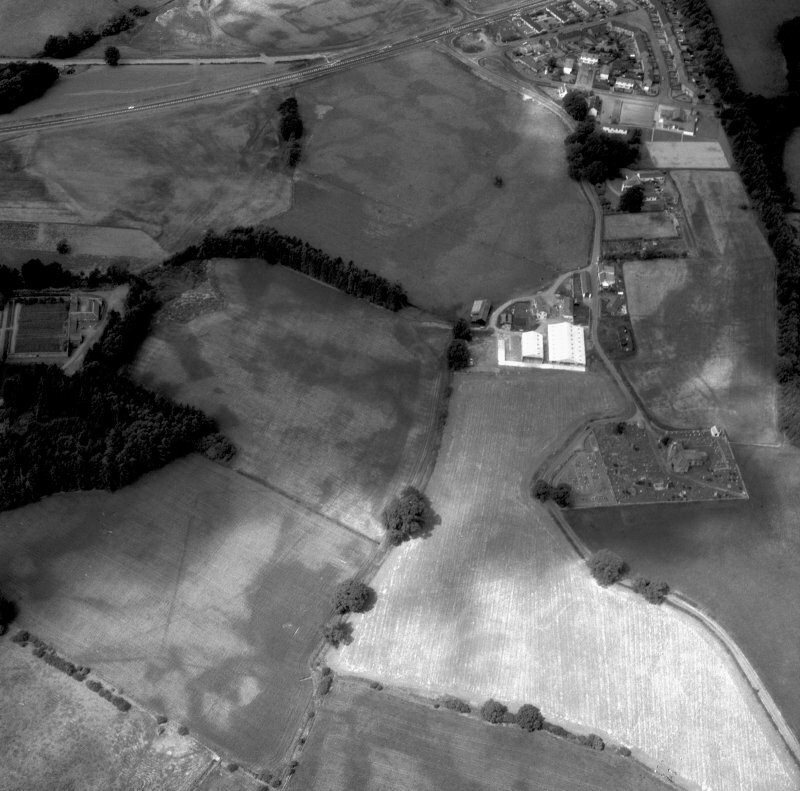 Holywood Abbey and Dalawoodie, oblique aerial view, taken from the SW, centred on the cropmarks SE of the Abbey, showing a rectilinear enclosure and linear cropmarks. 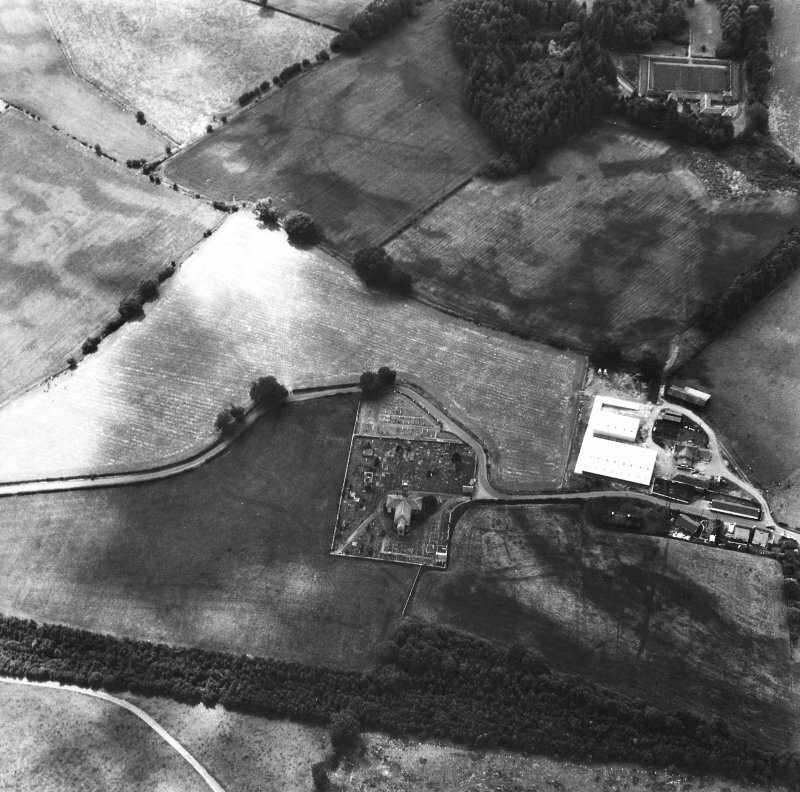 Holywood Abbey and Dalawoodie, oblique aerial view, taken from the N, centred on the cropmarks around the Abbey, and showing a rectilinear enclosure and linear cropmarks in the top half of the photograph. 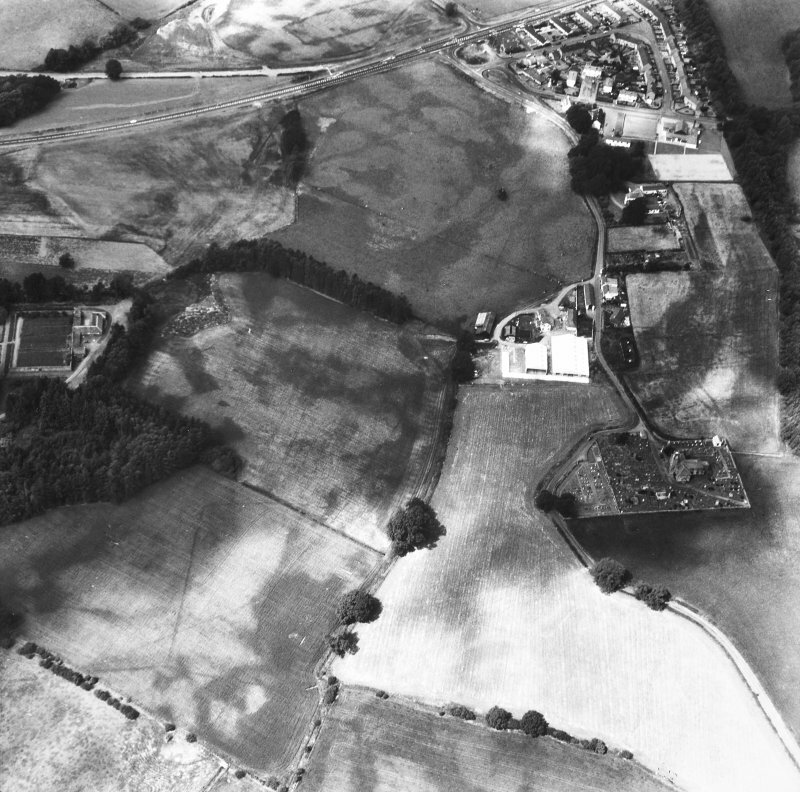 Holywood Abbey, oblique aerial view, taken from the WNW, centred on the cropmarks around the Abbey, and showing linear cropmarks in the top right-hand corner of the photograph. Not to be confused with Holywood Parish Church (NX 95495 79655), for which see NX97NE 516. The Premonstratensian Abbey of Holywood or Dercongal was established by 1225 and was erected into a temporal lordship in 1609. An almshouse for men was established within the limits of the abbey before 1362. The abbey was taken down in 1778 and the remains used to build the parish church (at NX 9549 7965). 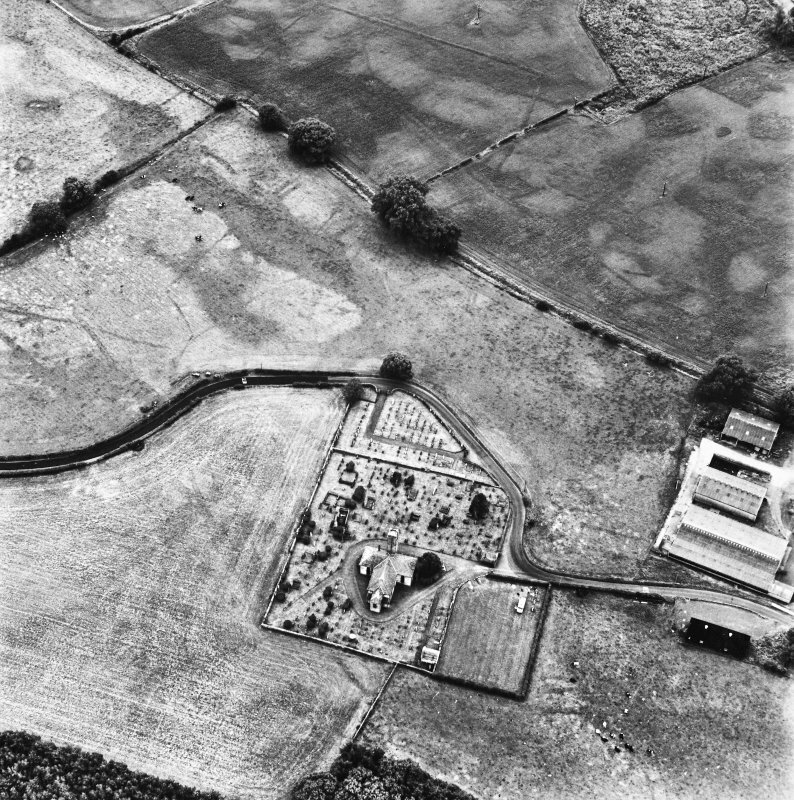 The main portion of the abbey lies beneath the present churchyard; building remains, small finds and burials have been discovered during grave-digging and excavations in surrounding areas. 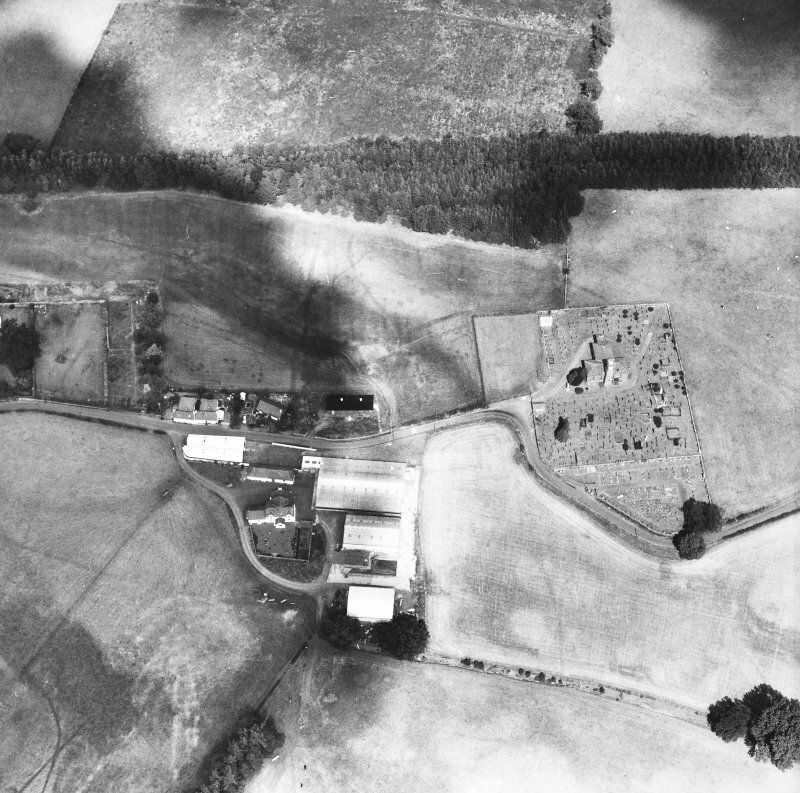 The site of the chancel is marked by a portion of wall running E-W and just appearing above the surface for a distance of 3 ft, though a neighbouring burial ground encroaches upon nearly half of it. A pillar within the churchyard marks the site of the entrance to the abbey. 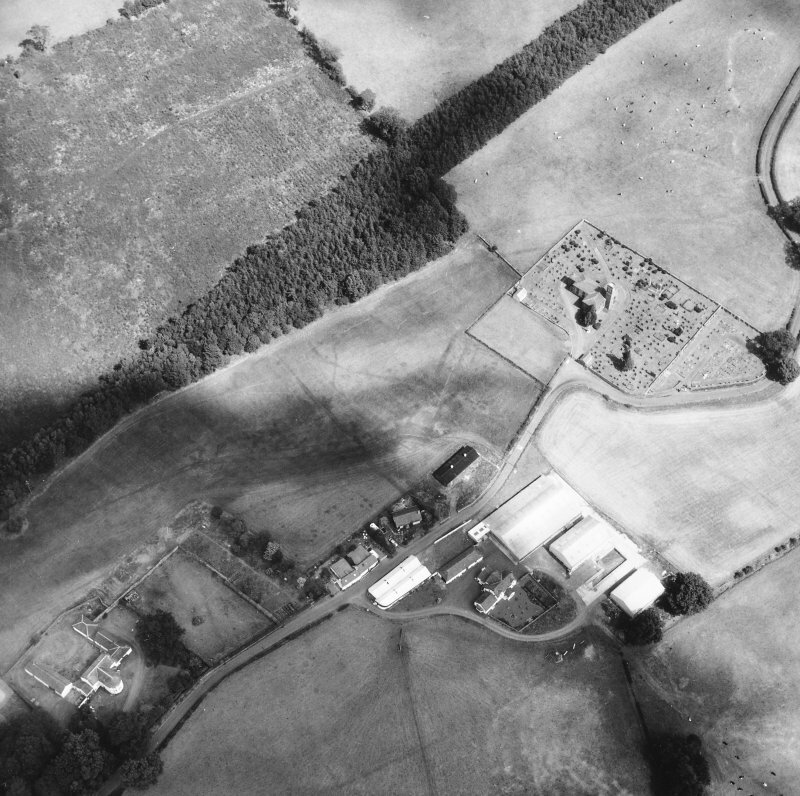 The finds have been divided between Cowhill and Dumfries Museum. No trace of this abbey could be found during field investigation. The pillar marking the site of the entrance to the abbey and the portion of wall marking the site of the chancel were not located. Enquiries at Cowhill revealed no knowledge of any finds from the churchyard; the owner was not in residence at the time of visit. Mr Truckell, of Dumfries Museum, states that some small pottery fragments from Holywood Abbey are in Dumfries Museum and that some sculptured stone heads from the Abbey are at Cowhill. 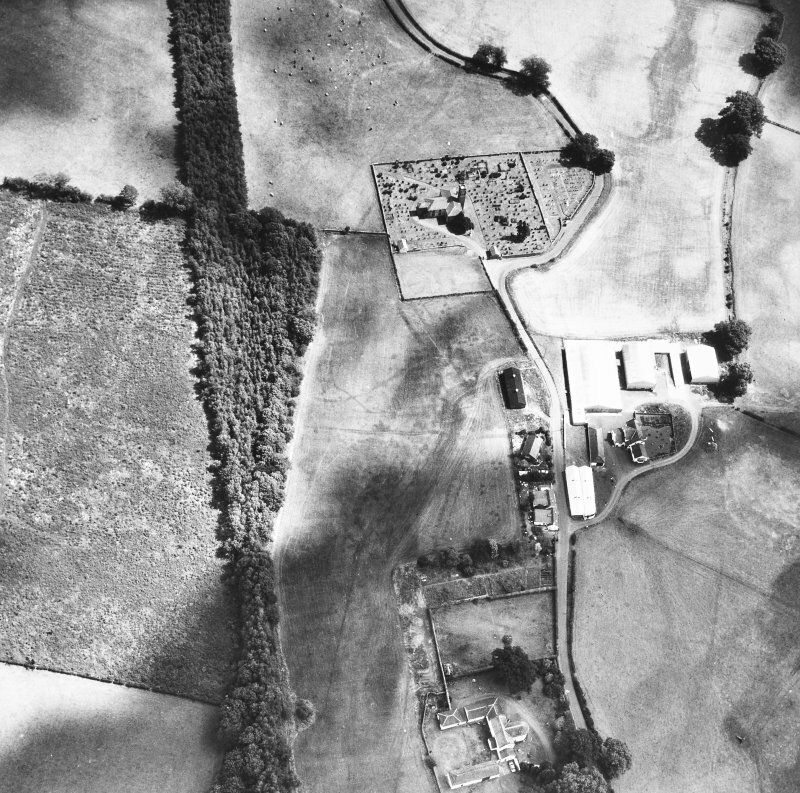 The pottery obtained during a brief trial excavation at the site of Holywood Abbey by Major Keswick of Cowhill in 1922 is fully described by A E Truckell and J Williams 1967. Further finds of pottery, bone, tiles etc, were made in 1967-8 when ploughing in the field E of the present churchyard; a richly foliated (?) 15th century cross, found about 1965 beneath the pulpit of the present church, is in the possession of Mr Keswick, Cowhill. Photographed by the RCAHMS. 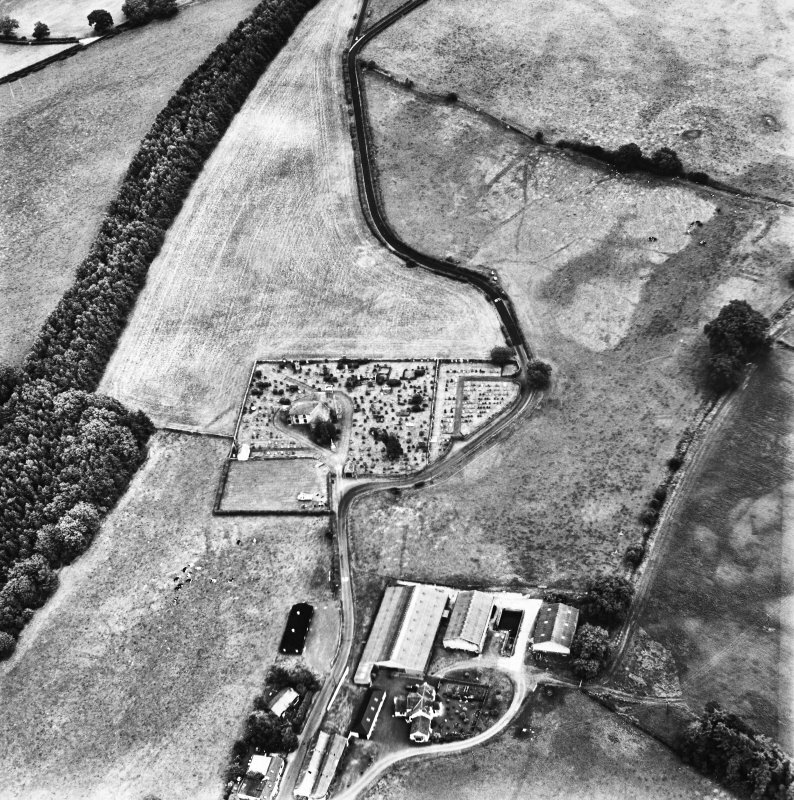 Settlement and agricultural patterns possibly relating to the Mediaeval Abbey. Parch mark of E end of Abbey. 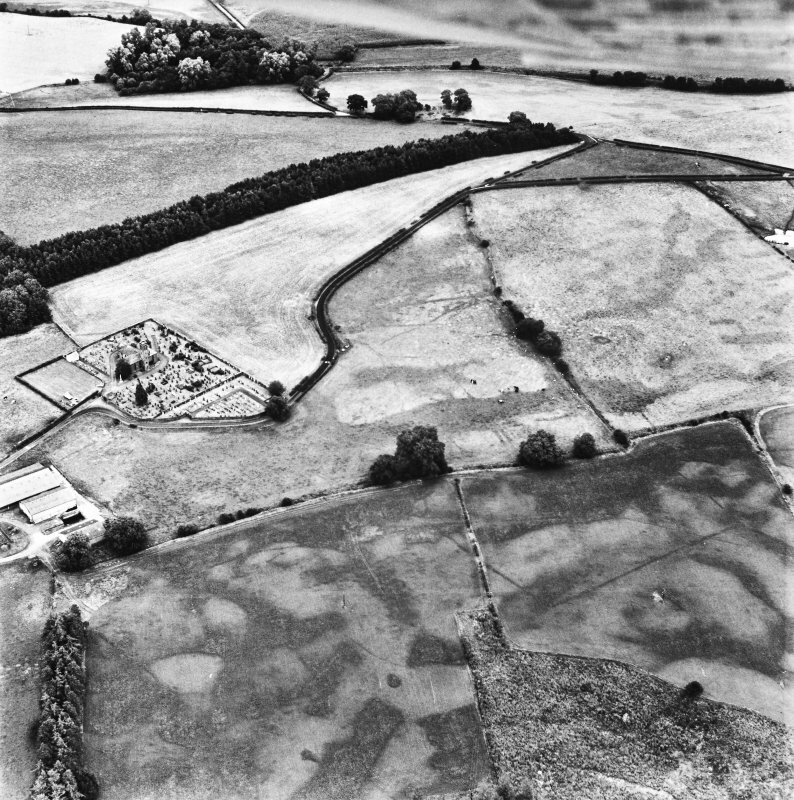 A complicated series of cropmarks have been recorded by aerial photography in fields to the E and W of the site of the Abbey. 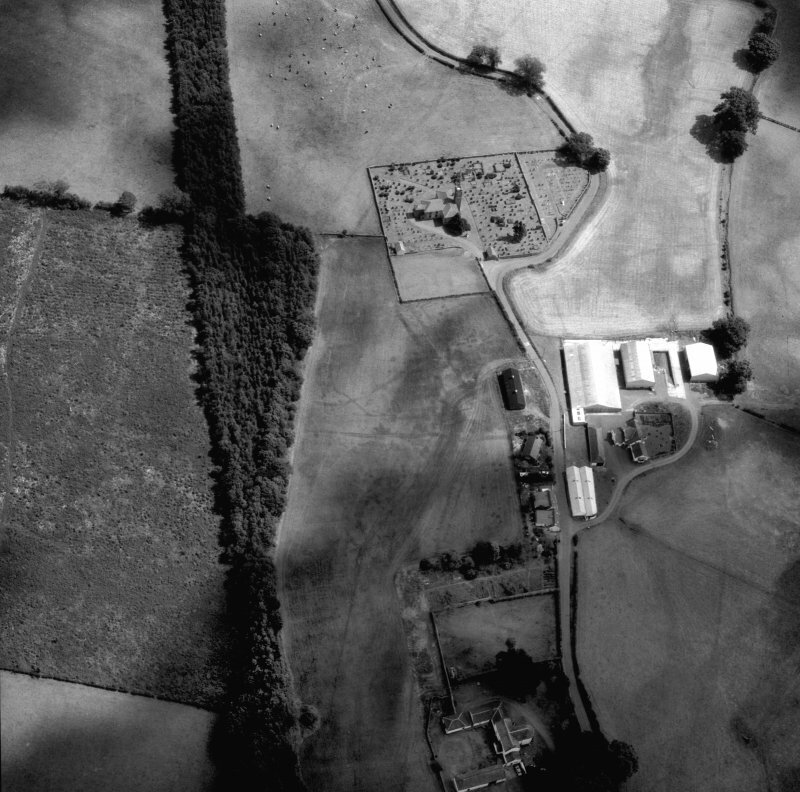 Only one of these cropmarks, a trackway running SE, from the NW corner of the churchyard to the nearby road, is depicted on the 1st edition of the OS 6-inch map (Dumfries-shire 1854-61, sheet xlix). Linear features which may represent sides of enclosures intersect and concentrate at NX c.9530 7970, and groups of pits are visible at NX c.9532 7967 and NX 9543 7966. Similar cropmarkings (NX97NE 171) have been recorded immediately to the SE of Holywood Parish Church. Information from RCAHMS (KB) 6 May 1999.